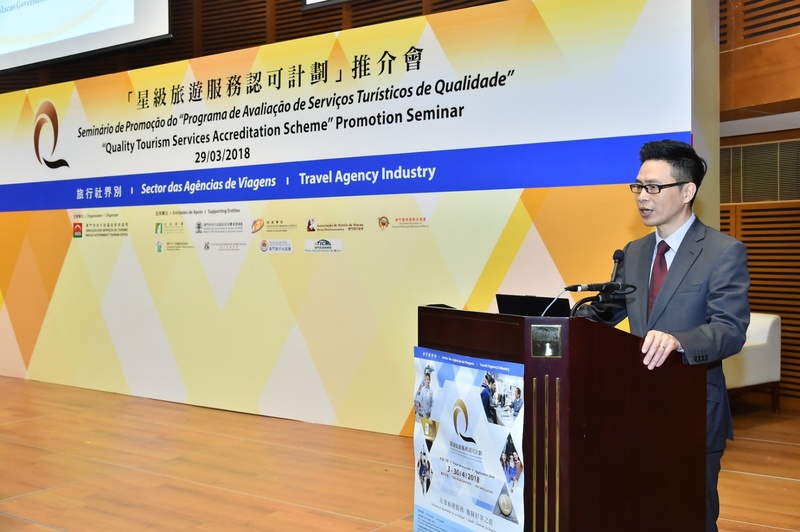 Macao Government Tourism Office (MGTO) held two promotion seminars today (29 March) at the Convention Center of Macao Science Center to call for new applications from catering and travel agency sectors for the Quality Tourism Services Accreditation Scheme (“QTSAS” or “the Scheme”), which has been carried out for the fifth year. Interested merchants that fulfill the necessary criteria for application may submit applications and related documents to MGTO from 3 to 30 April. 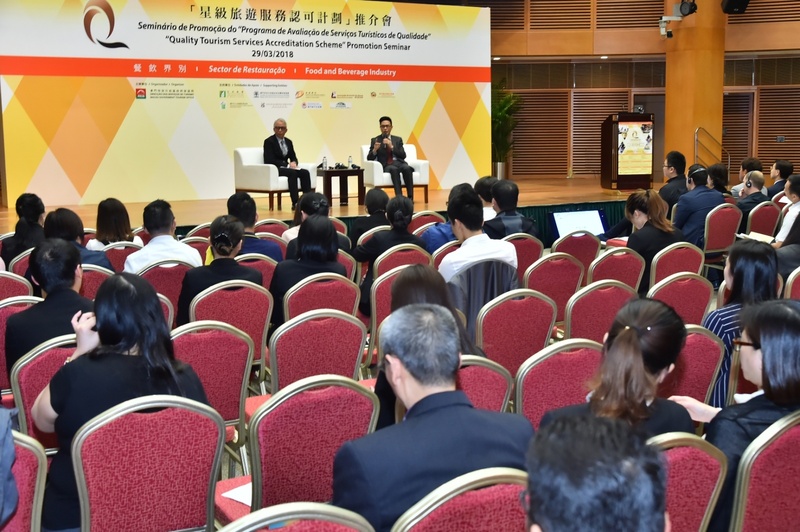 Acting Director Cheng Wai Tong of MGTO, the organizer of the Scheme, and representatives from a number of supporting entities were present at the seminars which introduced the application procedures and assessment criteria of QTSAS. The supporting entities for the Scheme include the Civic and Municipal Affairs Bureau, Consumer Council, Institute for Tourism Studies, Macau Hotel Association, the United Association of Food and Beverage Merchants of Macao, Association of Macau Small and Medium Enterprises of Catering, Association of Macao Tourist Agents, Macau Travel Agency Association and the Travel Industry Council of Macau. The Scheme includes two accolades namely “Star Merchant Award” and “Service Star Award”. 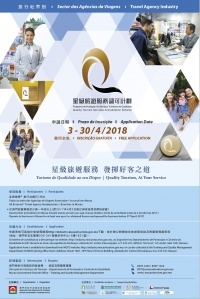 To commend travel agencies which provide high-quality service in Macao and beyond for their patrons, the Scheme also includes the “Service Star Award – Inbound Service” and the “Service Star Award – Outbound Service” specifically for the travel agency sector. Merchants that have successfully passed the assessment will be awarded the “Star Merchant Award” accreditation valid for one year to display in their shops. The catering businesses and travel agencies which are also awarded the “Service Star Award” will be presented a trophy and cash prize of MOP10,000 in recognition of their remarkable service. The quota of participating businesses is 80 for the catering sector and 30 for the travel agency sector this year. 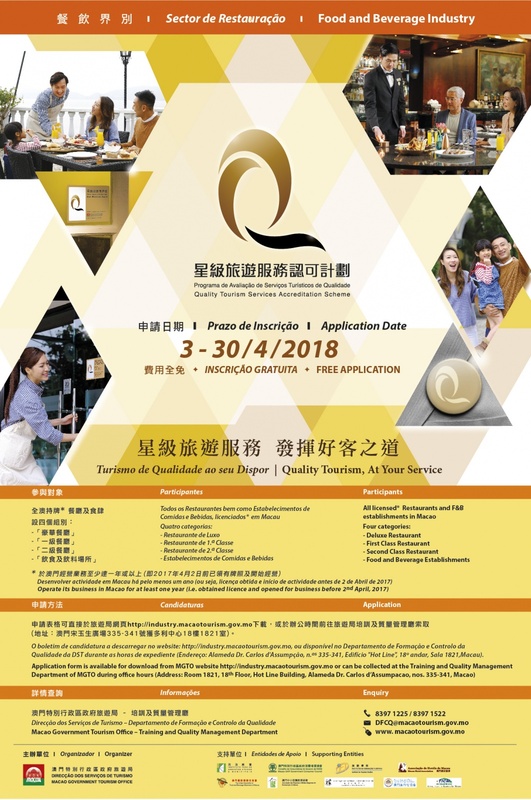 All licensed travel agency headquarters or branches and all licensed restaurants and F&B establishments in Macao that have operated for at least one year or above in Macao are entitled to apply. 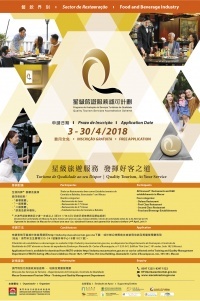 Application form can be obtained from MGTO or downloaded from the Macao Tourism Industry Net: http://industry.macaotourism.gov.mo. Interested merchants that fulfill the necessary criteria for application may submit applications and related documents to MGTO during office hours from 3 to 30 April. MGTO launched QTSAS in 2014 to establish service quality standards for the tourism industry, encourage and support industry partners to enhance their service quality as well as recognize tourism merchants and practitioners for their outstanding service and excellent service management, in line with Macao’s goal to become a world centre of tourism and leisure. The Scheme targeted the catering sector in the first two years and was extended to cover travel agencies in 2016. This year, MGTO will study the feasibility of extending the Scheme to the retail sector as well. A total of 232 catering businesses and 37 travel agencies hold the “Star Merchant Award” up to date. For details about the awarded merchants, the public can obtain the “Star Merchant Award – Restaurants and Eateries Guide” and the brochure “Star Merchant Award – Travel Agency Industry” from any of MGTO’s Tourist Information counters or browse MGTO’s website: www.macaotourism.gov.mo.